East Devon Ramblers are a very enthusiastic and friendly group, and we invite you to walk with us. Visitors and new members are most welcome. We offer a minimum of 5 varied walks a week ranging from a leisurely half day stroll to an all day strenuous hike. See our full walk programme here. ​It's a great way to walk in good company, meet new people, stay or get fit and simply enjoy our stunning coastline and countryside. We will celebrate our 50th year in 2020, so you can be confident you will be joining a successful and well established, locally run group. ​​Usually in and around East Devon and West Dorset but occasionally further afield to Dartmoor and Exmoor as well as other parts of Devon, Dorset and Somerset. 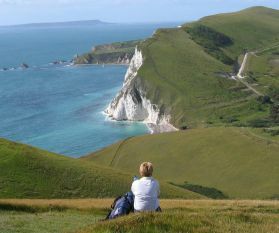 A number of our walks include sections of the Jurassic Coast, Britain's first natural World Heritage Site. There are no current stop-press items. The Ramblers are the largest representative body of walkers in the UK and we support the Ramblers’ objectives of protecting and enhancing public paths through our local network of footpath officers and by supporting Pathwatch. Please take a look at our Facebook page, you don't have to be a Facebook user to view the site. Join the Ramblers and become a member of East Devon Group. To Ford or not to Ford? (The shorter Good Friday walk). A moving target? (The longer Good Friday walk).